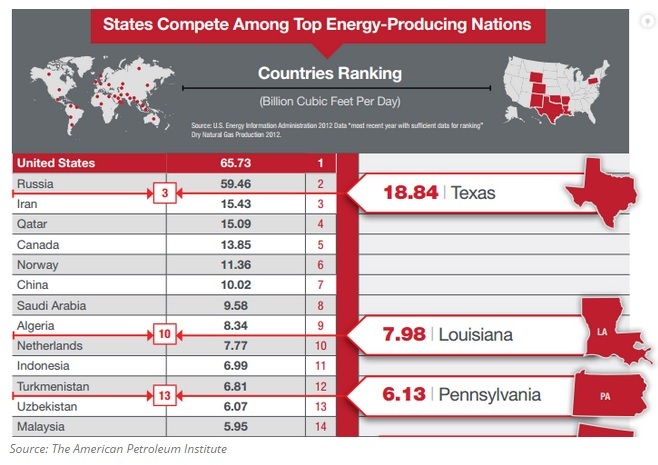 Did you know that Texas ranks 3rd in Natural Gas Production compared with other nations around the world? Texans generally love to boast that everything is ‘bigger and better’ in Texas. Sometimes this is just eager pride and sometimes it’s truly fact as it is if Texas was not a state, but a Nation. Texas' Petroleum Industry produced 18.84 Billion Cubic Feet of Natural Gas per day in 2012, just ahead of Iran and trailing Russia in the rank of nations. This data was reported in 2015, but reflects 2012 data as reported by the U.S. Energy Information Administration 2012 Data: Natural Gas Production 2012.